eHealth Consortium is pleased to announce a free quarterly seminar series in 2013 for members and the public, with the aims to boost the awareness of ehealth adoption for improved care delivery. Limited seats available, REGISTER NOW! Prior to founding SAM, Mr. Wilson Yeung has worked for over 30 years in the IT industry, half of which being with IBM and the other half running software development business under the entity YNA, with major focus in healthcare systems. Please email your full name, phone number, occupation and session no. 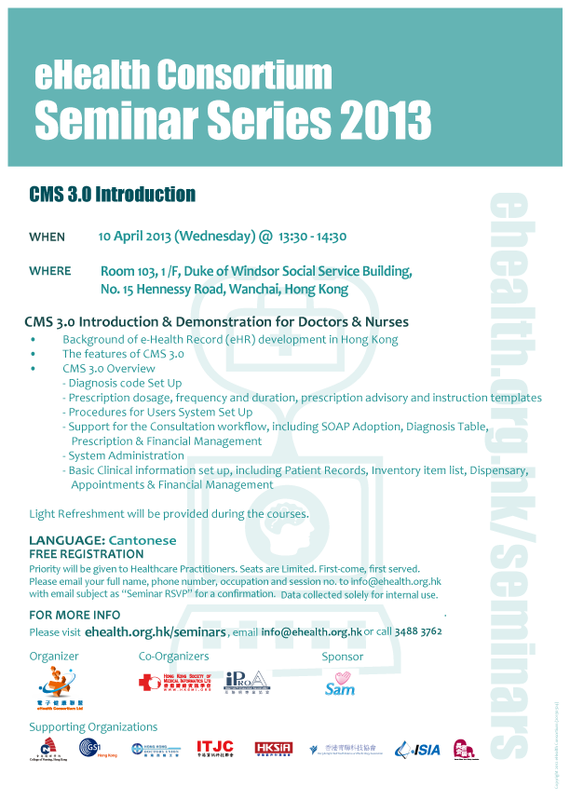 to info@ehealth.org.hk with email subject as ?Seminar RSVP? for a confirmation. (Updated on 26 Mar 2013) Stay tuned for information on our next seminar in Apr !